In this interview with Sarah Shaw, founder of Sarah Shaw Consulting, you’ll discover how to get your products to celebrities. 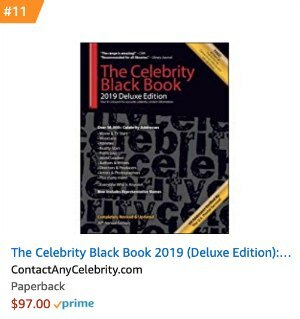 To learn more about how to get your products to celebrities, join Contact Any Celebrity now for instant access and check out our book, Celebrity Leverage. Sarah Shaw: I’m here with Jordan McAuley, author of the really cool book, Celebrity Leverage and founder of ContactAnyCelebrity.com. We’re going to talk and give you guys some information and insight into how you can get your products to celebrities. 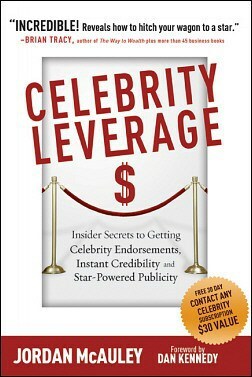 So, Jordan, I know you’re a publicist and started Contact Any Celebrity, but what let you to write your book, Celebrity Leverage? Jordan McAuley: People were always asking me so many questions about how they can get their products to celebrities and how they can use celebrities to increase their business. Instead of me having to answer everyone’s questions individually on the phone or by email which was taking up all of my time, I decided to put everything into the book which is Celebrity Leverage. Sarah Shaw: It’s a really great book, and I’ve learned a lot of really cool little tips that I’m going to ask you about today. Do you still work with private PR clients and do you do celebrity placement for those clients? Jordan McAuley: I really focus on sharing how people can do it themselves. I’m finding that with the economy, a lot of small business owners who I enjoy helping the most really want to learn how to do it themselves. That’s what I spend most of my time doing and why I decided to write the book. Sarah Shaw: Awesome that you did. Your book is a real do-it-yourself, step-by-step book. Just to be candid, how successful is the average entrepreneur in getting celebrity placements by themselves? Your book has a bunch of success stories, but how easy is it for the average entrepreneur if they follow your step-by-step formulas? Jordan McAuley: I wouldn’t say it’s easy, but I wouldn’t say it’s difficult, either. It really depends on like anything else how much you’re willing to work at it; how much you’re willing to follow up; how much you’re willing to think positively. I hear from a lot of people who say, “Oh that will never work for me, I just don’t have time.” Or, “That would be nice if I could get my products to celebrities, but I don’t really think I can.” If you come in with that kind of mindset, it’s probably not going to happen for you. It’s like any other kind of publicity endeavor. It’s not guaranteed. There’s no way to really guarantee that a celebrity is going to use your product or talk about your product. It’s PR, you send out a lot of stuff – all you need or one or two celebrities. The book just came out, so I can’t really say how many people have read the book and then said, “this worked for me.” But from my ContactAnyCelebrity.com service, I do have a lot of success stories from people. There are some of those in the book. Sarah Shaw: There are some great little anecdotes and stories in the book. I really liked those. You just mentioned time commitment. How much time would somebody have to expect to commit every week or month or however you divide it up to really make this process work and be a success? Jordan McAuley: It depends on what you’re trying to accomplish. For example, I talk in the book about celebrity gift suites where you can go to these events put on at major award shows like the Emmys and the MTV Awards. You could take one weekend, go there and come home with 75 photos of your product with celebrities and maybe a couple of celebrity endorsements. They usually have a publicist who pitches your product to celebrity magazines while you’re there. So you could take a weekend and come home with a lot of stuff if you’re willing to spend $2,000 to $7,000. If you want to do it completely for free just by sending product samples in the mail to celebrities, then that’s going to take longer. I would say if you focus on sending out one item to a celebrity every day or a couple of items each week, you should get something back within just a couple of months. Sarah Shaw: That’s not bad. It’s not like having to sit on the phone and make 20,000 calls a day when people are trying to do PR for themselves. That sounds totally reasonable to me. You mentioned celebrity gift suites. Is that a 100% paid service to be included in the gift suites or gift bags? Jordan McAuley: For the celebrity gift suites you have to pay. The prices range depending on the event. There are smaller events that are less expensive, maybe like $1,500 up to the Oscars which are a lot more. There are a lot of really cool events like the Sundance Film Festival and celebrity gift suites in Malibu at beach parties during the summer with a lot of celebrities. It really varies. You can also get your products in celebrity gift bags. Sometimes those want you to donate 75 samples of your product. Other times there is a fee to be included. There are pros and cons to celebrity gift bags. You don’t know for sure if the celebrity used your product. With the celebrity gift suite, you’re right there and can talk to them and get photos. Sarah Shaw: I used to do those celebrity gift suites when I had my handbag line years ago and I did events like the Grammys and had all of my products out and people came by the tables. For me, it never really panned out. Like they never delivered on the photographs they promised. Maybe it’s changed now and they’re more on top of it. Celebrity gift suites were just getting started back then, eight to ten years ago. Now it’s gotten to the point where celebrity gift suite photos are always in celebrity magazines like People and Us Weekly. Back then they weren’t interested in photos of your products with MTV in the background. How does that work now? What can you do with the photos that you get from celebrity gift suites? Jordan McAuley: It does depend on which celebrity gift suite company you use. I don’t know which one you used, but it sounds like it wasn’t that great. There are a lot of them and a lot that pop up. Anyone can set up a gift suite if you think about it. The good ones have relationships with the Hollywood community and get celebrities to actually come to the gift suite. They have to be really organized like how you were saying with making sure the photographers are there and that the celebrity gift suite vendors get photos of the celebrities with their products. There’s really only one company that I recommend. People can find out the name of it in the book. They do a really good job and I’ve referred a lot of people to them and no one has ever said anything negative. Everybody has always come home with great things to say. But yeah, everything has changed lately. If you look at magazines you see celebrities holding up products and they talk about the gift bags that were at award shows. Us Weekly for a while was giving away gift bags from award shows. You see celebrities like Kathy Griffin on TV talking about going to the celebrity gift suites and getting gift bags. I think reality TV has been a big part of this change because those are the stars that really love to go to the gift suite and they talk about it on their shows. The media and the public have picked up on this whole celebrity gifting thing. Sarah Shaw: Tell us about your Contact Any Celebrity website and how it works. Jordan McAuley: Contact Any Celebrity is an online database of almost every celebrity – there are about 60,000 celebrities in there. We include everyone from actors and TV stars and musicians and athletes to politicians, best-selling authors, artists, writers, supermodels; basically everyone who’s a celebrity. We give you their best mailing address, their agent, their manager, their publicist, and their charitable cause, which his really interesting. If you’re a nonprofit, it’s a no-brainer. If you have a product that’s a pet product, you can choose “animals” and it will give you a list of all the celebrities who contribute to animal-related nonprofit causes. Obviously, they would make sense for you to target with your pet product. We give phone and fax numbers and email addresses for all of the celebrities’ representatives. There are a lot of free celebrity websites online. They just give you the basic mailing address and never update them. We update our database every day. We have a team of researchers. We’ll do free research if you can’t find a celebrity who is in our database, like a celebrity who is brand-new and you want to reach them. Just drop us an email and we’ll research their contact information. If you find a celebrity’s contact information has become outdated, we’ll research it. If you do a mass mailing to hundreds of celebrities and some letters come back to you, we’ll refund your postage. You can call us up. We have a team of people that answer the phone, unlike most websites. You can’t get through to anybody anymore! The service is really reasonable; it’s only $1 for seven days to try it out. If people like it and they stay with it – we have Members who have been with us for years – it’s $29.97 a month. It’s pretty affordable for what you get. Sarah Shaw: That’s awesome! How does one go about deciding and targeting the right celebrities for their product line? What do you look for? How do you think about that logically? Jordan McAuley: That’s a great question because the biggest mistake people make is they target celebrities that they are a fan of, or that their family or friends are fans of, and the celebrity has nothing to do with the product. For example, I had one client who had written a book on customer service, and she wanted to get Ellen DeGeneres to write the foreword. I’m like, “what does Ellen have to do with customer service?” She liked Ellen. Everybody likes Ellen, but she didn’t really have anything to do with that book’s topic. Sarah Shaw: She probably likes good customer service, but that’s about it. Jordan McAuley: Right, she probably likes it. She’s also an A-list star. I’m not trying to tell everybody they’re going to get Angelina Jolie and Brad Pitt endorsing their products. You have to think a little bit below that. It’s sort of like applying to college. I mean yes you try them and send things to them. You never know. But also think below that. There are B, C, and D list celebrities. There are TV stars. There are soap opera stars. There are reality stars. There are people that were famous a long time ago. I used to use Betty White as an example, but she has totally jumped back into popularity. Sarah Shaw: I love Betty White. Jordan McAuley: Betty White, exactly! Sarah Shaw: It’s really easy in the beginning to jump on celebrities because you’re a fan of them. But you really have to match your brand’s image with the celebrity’s image. Sarah Shaw: Right. It’s got to match up in order to make an impact on your target market. Jordan McAuley: It’s who your target market pays attention to. Who do they like? What do they watch? Sarah Shaw: If you’re really in tune with your target market, those people are going to come to the forefront of your mind anyway. Sarah Shaw: Let’s say someone uses your ContactAnyCelebrity.com service and they send stuff out to ten people and it doesn’t get returned to them. How do they know if the celebrity actually got the product? Can they use their name? What gives you the authority to say, “I sent my product to Kristin Davis and Sarah Jessica Parker because I have these really cute handbags or jewelry or whatever, and it didn’t come back to me. How would you know for sure that they received it, can you use their name, and how would you be able to use their name? Jordan McAuley: I don’t recommend sending an expensive product to a celebrity in the mail because you’re right, it may never come back. The person in the mailroom could just take it who’s not even the celebrity’s assistant. Or the celebrity’s assistant could take it. If you’re worried about losing something expensive, I wouldn’t send it. Also, after 9/11, a lot of entertainment companies began returning packages when they don’t know where they’re coming from. Also, for example, people send scripts to studios. The studios just return scripts unopened because say they open it and a movie comes out a year later and it’s kind of along the same lines as the script that was sent. There have been a lot of lawsuits in the past with screenwriters claiming that a studio stole their idea. So they just return packages unopened. I recommend sending a nice note saying that you’re willing to customize something for the celebrity. Say you’ll send it free and you just need to know who to send it to. You always want to offer something customized. I wouldn’t just send a purse. But if you send a note with some photos and a brochure about you and say, “I’d love to send Sarah Jessica Parker a customized purse,” then the odds are more likely they’ll get back to you. You have to send it to the right person. People always think they’re supposed to send products to the celebrity’s agent. Everyone says, “Oh, send it to the agent” or “contact their agent.” The agent is the worst person to send your product to. I worked at two talent agencies. First of all, that’s not their job. Second, they’re not even nice about it. They’ll just take it or throw it away or whatever. You want to send it to the celebrity’s publicist. If they don’t have a publicist, send it to the manager. Management companies are smaller firms and they’re nicer. The publicists are sometimes big corporate companies, but their job is to handle products and clothes and things like that for the celebrity. You have to experiment. It would be great if there was a perfect step-by-step system, but every company, representative, and celebrity is different. There are so many things that come into play. It’s really just testing and seeing what works best for your product. Sarah Shaw: Yeah, wouldn’t it be great if there were just steps one through ten; follow them and you’ll be famous. Jordan McAuley: That’s the thing with celebrities, they’re all different. They all have different personalities. They all work differently. Each company has different procedures and different rules for how they handle things they get in the mail. It really just varies. I give you some guidelines in the book, but it’s really up to you to test. Sarah Shaw: I love the tip you gave about using FedEx to deliver packages as opposed to UPS or USPS because gatekeepers perceive it as something more official and pass it up the food chain. Very clever. I worked in the film business for a long time and we only had a FedEx account. We never considered using UPS for anything. Everything was sent by FedEx, so I had a giggle when I read this. It’s a genius tip. You have other tips like that, little secret things. Sarah Shaw: Right – what’s in it for me? Jordan McAuley: Exactly. Say, “I’d like to send a customized handbag to you and the celebrity you represent.” That’s going to work a lot better. Sarah Shaw: Pretty much everybody wants to get something for free. I really like that idea. I recommend that to people all the time too when they’re trying to do their own PR. You might not be able to get to the accessories editor or the pet editor or to the editor of Oprah or O Magazine. But you can make friends with their assistants and start to work your way up the food chain getting to know people and being friends with the gatekeepers. Sarah Shaw: In the book, you give a lot of references to companies that offer celebrity endorsements for a free. What’s the real difference between hiring somebody like that and doing it yourself? I know they’re not cheap; they can be quite expensive. Jordan McAuley: I think what you’re referring to are celebrity endorsements. Celebrities charge a lot of money to endorse a product. Companies spend millions of dollars getting A-list celebrities to use their products on infomercials and TV shows. If you’re a small business, you can do a little bit of the same thing without spending a ton of money. In the book, I talk about a client who has a t-shirt line for kids and sends t-shirts to celebrity parents. Doug Savant from Desperate Housewives and Laura Leighton from Melrose Place (they’re married) send her back a note saying, “Thank you so much. Our kids love the t-shirts” and included their email address. So the designer emailed back and said, “Is it ok if I use what you said on my website?” Doug Savant wrote back, “Sure, that’s fine. Just please leave out our kids’ names.” So now she has that endorsement on her website. And right now, let’s face it, everyone is online. Jordan McAuley: Ten years ago people may not have seen the website, but now everybody goes online and looks at websites. It’s just more publicity for the celebrities. Celebrities are public figures. I’m not an attorney, but don’t be too scared about using things they’ve said if they send you a thank you note. A lot of my clients have scanned the actual thank you notes they’ve received from celebrities like Halle Berry and Sarah Jessica Parker and these big stars. They’ll scan the thank you note and put it on their website. The worst thing that’s going to happen is the celebrity’s PR firm is going to email you and say, “Please take that down.” But at the end of the day, PR firms realize it’s really good publicity for the celebrity and it makes them look good. Like wow, they actually took the time to write a thank you note, they must be really nice. It makes her more human. It’s just more exposure for her. So legally, you may not have permission, but at the end of the day it’s all PR and the celebrities love the exposure. As long as it’s not a horrible product or as long as you didn’t fabricate a thank you not that they really didn’t send you, I wouldn’t be too afraid of using it. Sarah Shaw: I’ve seen a lot of those thank you notes on websites. Sometimes you’re really amazed, like, “Wow, that person really did write back.” I remember got something to Marisa Tomei years ago and she wrote me back a hand-written note and I almost fainted. Here’s this busy, Academy Award-winning actress and she’s writing me a note on her personalized stationery. How far along in business does one have to be before trying to get celebrities attached to their brand? Jordan McAuley: I think they should start trying from Day 1 because it’s so important right now. Everybody pays attention to celebrities and every business either has a celebrity on board or is trying to get a celebrity on board. It’s something you really need to focus on from the very beginning. I would wait until you have a quality product though. Don’t send messed up products to celebrities. If you can say this celebrity uses my product, it’s only going to help you get your product distribution in stores and publicity and mentioned in celebrity magazines. It’s kind of sad in a way, but that’s what the world cares about right now. Which celebrities are using this? Jordan McAuley: If you flip through Us Weekly – I was thinking about this the other day – they always have photos of celebrities holding up products. They don’t say in the magazine that it was taken at a celebrity gift suite. They just say, “Cameron Diaz loves these soaps!” and she’s holding up soap. People think paparazzi caught her at a store. Usually, it’s the celebrity at a gift suite and that’s where the magazine got the photos from. So if you want to get a big photo like that, then sending photos from your gift suite and pitching the magazines right after preferably with some kind of story angle that goes with it. Pitch that immediately. But if in your press kit you have a list of celebrities that like your product or have used your product that helps also. It really depends on what you’re trying to do. Sarah Shaw: Let’s say you get your product to Cameron Diaz through her manager. You even get a note back from her saying, “Thanks so much for the necklace and earrings” or whatever. At that point, could you just send a photograph of the jewelry to InStyle and say, “Cameron Diaz has this necklace and earring set and loves it,” without sending them a copy of the thank you note? You might not have gotten a thank you note, but the manager might have said, “We gave it to her and she loved it.” Will they take your word for it these days? Jordan McAuley: No, I don’t think they would. It’s better to connect it somehow. I keep saying gift suites, but there are other ways to get photos of celebrities with your product. But if you did a gift suite, FedEx photos overnight immediately. A lot of people wait. That’s a big mistake. You get home and then it’s a week or two weeks later – maybe a month later – and then you’re like. “Oh, I should send some of those photos out.” By that time it’s too late because magazines only care about what’s immediate. Especially with blogs, everything has to happen so fast. So this really needs to be done the next morning. I think there needs to be a connection so they have a little bit of proof. Most magazines and journalists are not just going to go on what you said. They feel more comfortable having proof because anybody could be like, “Madonna loved my earrings.” They don’t want to print that and have her people be like, “She’s never seen those or used those” and then the magazine looks bad. Sarah Shaw: Of course. Just so people don’t think it’s impossible. I sent stuff to celebrities and didn’t always know whether the person received it, so I felt like I could put them on my celebrity list. Months later they showed up in magazines with the product. At that point, I can use the magazine clipping and use that to get more sales for stores, which is ultimately everybody’s goal to use celebrities to leverage more money. Jordan McAuley: You’re not always going to hear back, so it’s important to monitor those paparazzi shots. Sarah Shaw: I have this free service, FamousProducts.com [no longer active]. I offer leads and connections directly to wardrobe departments for TV shows and movies. We’ve had a couple of items placed on pilots coming up and we have products going out to NCIS Los Angeles right now. We’ve had products go out to Parenthood the TV show and next week I’m sending products out to Giada on the Food Network for Everyday Italian. A friend of mine is a friend of her husband and they would love to get products from people. So once you’ve gotten your product on a TV show or movie, do you have to wait until the show has aired to try to get a still from it? Or can you just go out there and say to the press, “My products are being used on the Parenthood show” by whatever character? Jordan McAuley: As long as they filmed the show and they actually used your product. I think it would be ok to say, “Featured by” the TV show. It’s best to wait until it airs. I was the filming of Dr. Phil’s very first episode of his talk show because my friend was a producer on it. They never aired that episode because he was a nervous wreck, which is funny to think Dr. Phil was a nervous wreck. It was his very first episode so it was understandable that they never aired it. It really just depends on your comfort level. If I had a product on that show I would probably say “Featured on Dr. Phil” I wouldn’t say “As Seen on Dr. Phil” because nobody saw it. The wording that you use is really important. Sarah Shaw: That’s a great ip. Then obviously, once the show airs you can try to get stills from the episode. Jordan McAuley: We created a product about how to get your products on Oprah. The headline I wrote for it was “Oprah Wants You.” I thought it was really catchy and I did a teleseminar about it. Literally the next morning I got a fax from Harpo. They must monitor every mention of Oprah with Google Alerts because it was literally the next morning. I’m like how in the world did they hear about this? They said we could not use ‘Oprah Wants Use” because it implied endorsement. But at the bottom of the letter, they said we could use “How to Get Booked on Oprah.” So it’s all in the wording – in that case, we were just a couple of words away from a lawsuit if I didn’t change it, so yeah this is totally fine. The words you use are so important to pay attention to. Sarah Shaw: That’s really great advice. Everybody write that down. Thank you so much for this really great information. Do you have any parting tips? Jordan McAuley: Another tip – I was just reading this the other day – is that Nancy Grace said in an interview that she loves to wear necklaces her fans send her. The View has four famous women on it every day. If you’re a jewelry designer you can send necklaces to different TV hosts. The wardrobe department has to come up with something different every single day and a lot of times they film two episodes in one day. I went to see Wendy Williams’ show last week. They were filming two shows that day. I’m going to Martha Stewart next week. They’re doing two shows in one day. Think about the stress the wardrobe department is under to always have something different available. If you send a necklace – the odds are pretty good that someone is going to wear it. Then you can say “As seen on The View’ or “As seen on Martha Stewart.” There’s a story in my book about a jewelry designer who sent her jewelry to the wardrobe department on The O.C. when The O.C. was a huge show. They loved it so much they outfitted all the girls on the show with her jewelry. Then Amazon created a whole store just for her jewelry in the “As Seen On The O.C.” section of Amazon. That cost her nothing. Sarah Shaw: That’s an awesome tip. There are so many women out there who are anchors now and TV hosts. You could even send it to Ellen or to the judges on American Idol. Jordan McAuley: Exactly. I know someone from Atlanta who has a Web site about Atlanta. They sent t-shirts with their Web site on it to contestants on American Idol, and one who was from Atlanta, Michael St. John, wore it on the show. You just never know. Sending your products to celebrities is great. – To learn more about Sarah Shaw, visit The Entreprenette or follow her on Twitter @Entreprenette.